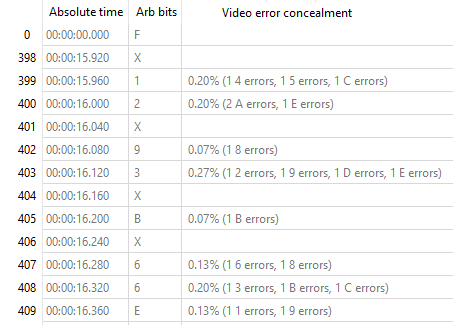 DV Analyzer is a technical quality control and reporting tool that examines DV streams in order to report errors in the tape-to-file transfer process, such as video error concealment information, invalid audio samples, timecode inconsistency, inconsistent use of arbitrary bits in video DIF blocks, and DIF structural problems. DV Analyzer also reports on patterns within DV streams such as changes in DV time code, changes in recording date and time markers, first and last frame markers within individual recordings, and more. Initially funded, designed and led by AVPreserve; developed by MediaArea. The reformatting of DV tapes (such as miniDV, DVCam, and DVCPro) to DV file-based formats is a point when the introduction of permanent errors is of particularly high risk. Most capture tools for DV only report errors if they are significant, such as a lost frame, whereas other documented errors are not reviewed. DV Analyzer provides a way to analyze and report audio, video, subcode, and structural errors within a DV file. This enables automated quality control and the ability to verify the accuracy and integrity of the reformatting process on a frame-by-frame basis. The DV format is rich with temporal metadata. Every frame may contain time code, recording date and time information, recording markers, and more. DV Analyzer reports this information which can be used in a variety of meaningful ways when working with and preserving DV content. This is particularly useful in documenting source material of edited DV content. Check a list of information that DV Analyzer interprets. This case study documents presents sample DV files along with explanations of various errors or events that DV Analyzer may reveal in the tape to file migration of DV video. It is Open-Source software which means that end users and developers have freedom to study, to improve and to redistribute the program (GPLv3+ for the code developed by us).